The course has a lot to offer. It is full of excellent and relevant content that is explained in ways that are easy to understand. “I visited other universities at open days and in comparison the facilities at NTU were a lot better. All of the staff and students that I spoke to were friendly and keen to answer questions. I also love the location of Brackenhurst Campus as I have always enjoyed being in the countryside, but at the same time it isn’t too far from the city centre or Southwell. “The FdSc Veterinary Nursing course has been amazing as it has allowed me to expand my knowledge of anatomy and has taught me a lot of new information also. I like the way the course is set out and the way the tutors present their lessons as I find it easier to understand. It is a hard course that requires a lot of time and thinking but it has been worth it. “I thoroughly enjoyed the anatomy element of my course, especially the dissection practicals as I found them very helpful, enjoyable and it made the content from lectures easier to understand. I love the practicals that we do such as animal handling and practicing some key nursing jobs such as administering medication. I also enjoyed the field trips that we went on including Pride Veterinary Hospital and Vet Fest. “I would say that the course has a lot to offer. It is full of excellent and relevant content that is explained in ways that are easy to understand. All the tutors really care about every student and do whatever they can to help make things easier for each individual. The course and tutors set you up perfectly for when you go out into placement which makes it a lot easier to get along in that placement. You have to be willing to put in the work because you get out what you put in. it can be hard at times but it is worth every second of it. “I have recently completed a 6 week placement over Easter and a 12 week placement in the summer holidays. Placement is a lot of fun and it helps to grow your confidence a lot as you get to apply the information you have learnt to real life cases, which makes you realise that you know a lot more than you thought you did. 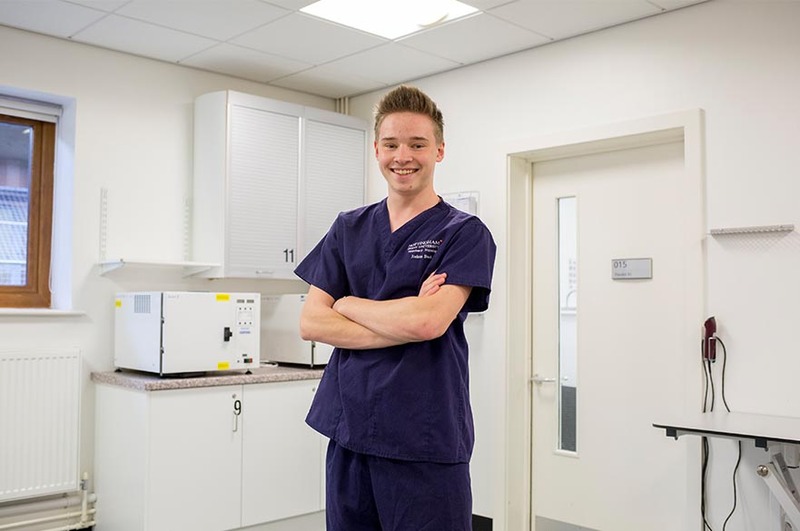 “During my time in placement I saw a lot of interesting cases and I got to do a lot of new things such as blood tests, administering medication, preparing patients for surgery and by the end of my placement, recovering patients after anaesthetics and even getting to have my own solo kennel shifts. My favourite part of placement was helping puppies during a caesarean section procedure. “My course tutors are amazing. They are very good at teaching and deliver all the content in a way that is best to understand. Also, they are always there to talk to if you have a problem or don’t understand something. “They are very helpful when it comes to finding a placement and are very supportive throughout the placement. They are all qualified and in practice, which I find useful as it means they can share their own experiences with us which helps to keep lectures interesting. They are very understanding and caring when you have a problem and are also there for you on a personal level to give advice. “Being a student here is great. There are lots of opportunities given to us by the university for nights out and events to go to. The location is ideal as it is in the countryside but also close to Southwell and not too far from the city. The campus is easy to navigate and the facilities are great. The accommodation is nice and is close to Bramley for lectures. All the people on campus are really nice and it is easy to make friends. Since becoming a student here I have had the best year of my life.